Josh Anderson gets his first NHL goal. As young as the CBJ have been this year, amazingly, they are getting even younger and lest experienced. Now that grizzled veteran Nick Foligno, all of age 28, is down with an injury for a bit, Kerby Rychal has come in to replace him. In addition, Josh Andeson has been called up for an extended look, and we have a pair of rookies as the goal tending tandem in Forsberg and Korpisalo. William Karlsson is a rookie, and newly acquired Seth Jones is 21, though he has played 200 NHL games, making him widely experienced. Veteran All-Star Brandon Saad just turned 23, and Wennberg is only in his second year. Yowza that is a lot of youth. So when Porty legitimately poses the question over in Puck Rakers about why this squad was out hustled for 6 periods, my response is youth. They are going through it all for the first time, first trip to Raleigh, first games against the 'Canes, and as a group they aren't operating at full NHL speed yet. An illustration last night was a quick pass through the slot from Saad to Wennberg, that Wennberg had to kick up to his stick. The action of kicking the puck up to his stick gave the goal tender just enough time to get set for the laser shot that came in right after. 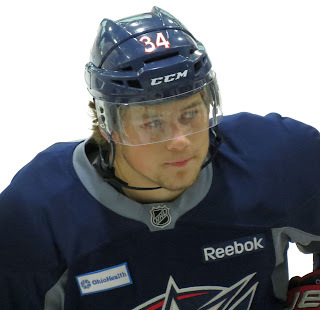 With more experience, and in the future, that puck is on the money and Wennberg has a really great chance. I think that is the process we are going through right now, and it just takes some time. Back to the game. The NHL declined to impose further discipline on Brad Malone for his hit on Nick Foligno. I thought it was a head shot. Until I watched the player safety video. They did a good job. The CBJ, rightfully so, assessed their own penalty when Jared Boll dropped the gloves with Malone at 2:15 gone in the game. Malone manned up and stood in there. Good on him, all square now. After that, Carolina settled into patiently breaking down our defense, scoring a power play goal, and getting good penetration to the net that resulted in at least one more. Down 3-0, and on the penalty kill late in the second period crafty veteran Cam Atkinson (age 26) stole the puck and went the length of the ice to score the short handed goal, a real beauty. Sorry folks, my power went out, and is still out, so I'll finish this later.